The engine is Experiment 4-6-0 No. 1652 Middlesex. Would someone start by identifying the location and date ? The mystery may be the wagons - can someone describe those. I believe the location is near Kenton looking south between the opening of the electrified lines and the mid 1920's. 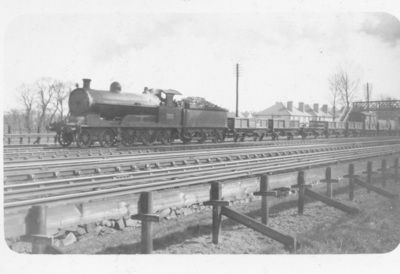 Four of the first five vehicles are LNWR D468 21ft 0in open fish trucks with the third being a D466 21ft 0in open carriage truck with the higher sides. I agree with Bob. What are the wooden crosses? Yes, Bob is correct. The train is on the Down Slow line at Kenton. I think it's footbridge 40 to the north of the station at Bonnersfield Lane, although it could perhaps be footbridge 37. See discussion of this area in the letters column of vol.10 no.7. The headlamp code is not easy to see, but I think it is for an Express Goods (No.6 lamps). The "Experiment" presumably has the vacuum brake - it is possible that it has a fitted head including the fish trucks (which were fitted) and is thus running under "maltese cross" conditions. If it dates from after May 1925 then the LMS code applies and it is a Through Freight, but essentially the same sort of train as the previous Express Goods. The fish trucks are probably empty, being returned to Crewe or elsewhere to "wait orders". As to date, it is after the New Line was electrified in 1917. It is perhaps more likely to be early 1920s, as the new houses on the up side might be of a style related to that date. No doubt the date they were built could be established by searching the Building Plans of the relevant Borough or UDC. From a plan of the line, I can confirm that the photo is of Bridge No 40 taken looking eastwards. The bridge is located about 1/4 mile north of Kenton Station. Today it is officially known as ‘Kenton Recreation Ground Bridge’ and is located at 10 miles 1,079 yards from Euston Station.